The Runner’s Spirit | Run Inspired. The runner’s spirit is undeniably compassionate. It is not easily broken nor is it quickly deterred. The runner is unique. With eyes wide open, he attempts to defy the norm and embrace the pain. It is a spirit in the forever pursuit of another level. The runner is humble. Kind. Selfless. And supportive. I’ve never met a mean runner and I’m not sure they exist. Oprah once said running is a metaphor for life and she is right. Running is easy. It is hard. It can go uphill, and it can go downhill. But above all, the runner takes each of these challenges and perseveres. Not only are we connected by our countless miles, we are brought together by a common understanding of what it means to suffer. And what it means to prevail. Yesterday the running world changed forever, and although none of us can say exactly how, one thing is for certain. I, along with so many others, am damn proud to belong to this remarkable community. I have never been prouder to call myself a runner than I am right now. May our kindness, compassion, and relentless resolve continue to support those in Boston. For in the end, goodness will win and our community, those in Boston, and those around the world will be stronger than ever before. Because we are runners, and we do not back down. And in the words of Martin Richard, No More Hurting People, Peace. Yesterday and today I ran for Boston. As I watched the news yesterday, I became so overwhelmed and left the house in tears. Today, I wanted to be out there with the thousands of other people wearing our favorite race shirts, supporting those affected by yesterday’s tragedy. And with every runner I saw, there was a smile, a nod, and a silent understanding. In our own way, hundreds of miles away from Boston, we were showing our support the best way we knew how. By running. There truly is no better sport. Thank YOU! Yes, Mario and I are glad we are here this year instead of there. 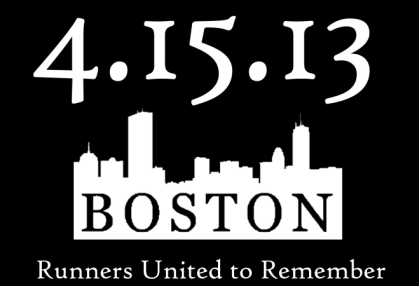 My heart really goes out to those in Boston and the many runners affected by this tragedy. Boston is such an amazing city with amazing people. It’s impossible to believe someone would do such harm. Love this post. I was there too during the marathon expo. Good thing we decided to leave boston on sunday. Glad you are safe. It may take time for runners to heal but we will get up stronger than ever.